After the initial rush of men to join the fighting at the beginning of the Great War the country seemed to pause. However, after the Battle of Marne (an Allied victory but beginning of trench warfare) the realisation became clear that an end to war would not come quickly. The true realities became obvious and beyond the death and destruction in Europe, on the Home Front men were beginning to return home with horrendous wounds, rationing was introduced, zeppelin raids began to occur and women took on the additional responsibilities of men’s jobs. To complete this picture, life’s usual struggles continued the rent needed to be paid, meals to be cooked, the children fed and educated. 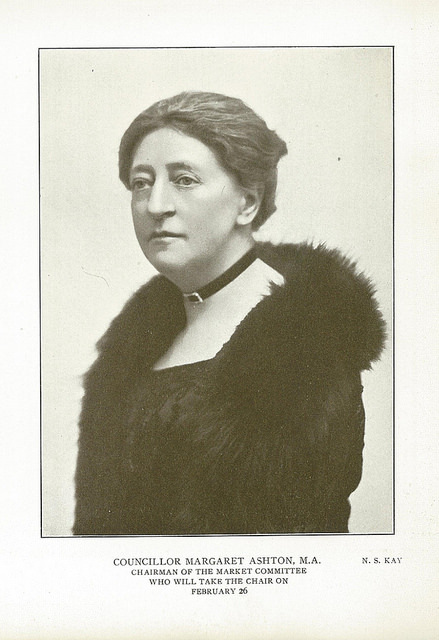 Mancunian Margaret Ashton, a non-militant suffragist, Manchester City Councillor and active Peace campaigner. Manchester Central Library – GB127.M50/1/12/6. Born in 1856, Margaret was the daughter of Hyde mill owner Thomas Ashton, whose family were early cotton pioneers in Hyde. The family were well known for the good conditions provided to their workers and their estate at Flowery Field became a testament to their work. The Ashton’s were amongst the first employers to provide day schools for their child workers. Aston Brothers Mill, Flowery Field, Hyde c.1920. 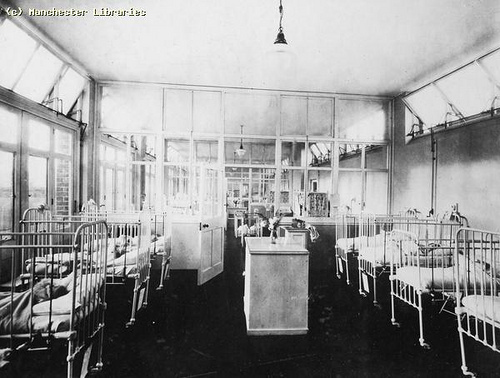 Manchester Babies Hospital extension, Manchester, 1927. Manchester Central Library. 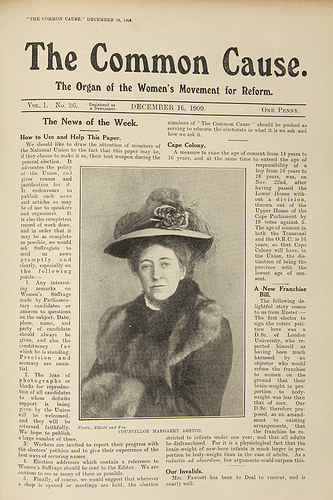 Margaret financially supported the ‘Common Cause’, the suffragist newspaper. Manchester Central Library: GB127.M50/1/8/1. 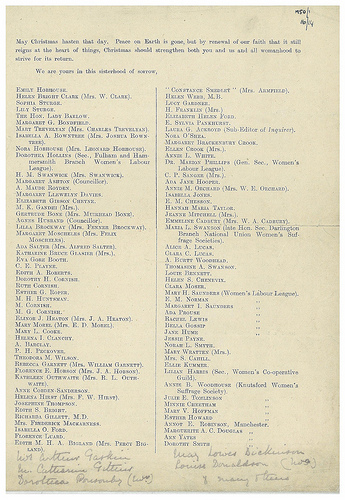 Open Christmas Letter, January 1915. Manchester Central Library. Unfortunately, only two representative from Great Britain managed to attend the Congress. One hundred and eighty delegates were ready to travel including Margaret Ashton and Sylvia Pankhurst, however travel papers were refused to all but twenty five. In the end, only two delegates Kathleen Courtney and Chrystal Macmillan managed to reach the conference as the British Admiralty coincidentally closed all transport to shipping in the North Sea. Delegates on the authorised list made every effort to board the last boat to cross the North Sea with Margaret Ashton and Maude Royden arriving from “remote parts of the country” at dawn. All to no available, the disappointed women then waited at Tilbury Docks for 10 days until the Conference had ended and returned home.